Shottle Hall Derbyshire Wedding Photography. Shottle Hall in Derbyshire is a stunning wedding venue. A beautiful country Manor House with large formal grounds and gardens to explore, it's easy to see why the venue describes itself as the premier Derbyshire wedding venue. The house itself is amazing, but the grounds have to be seen to be believed. 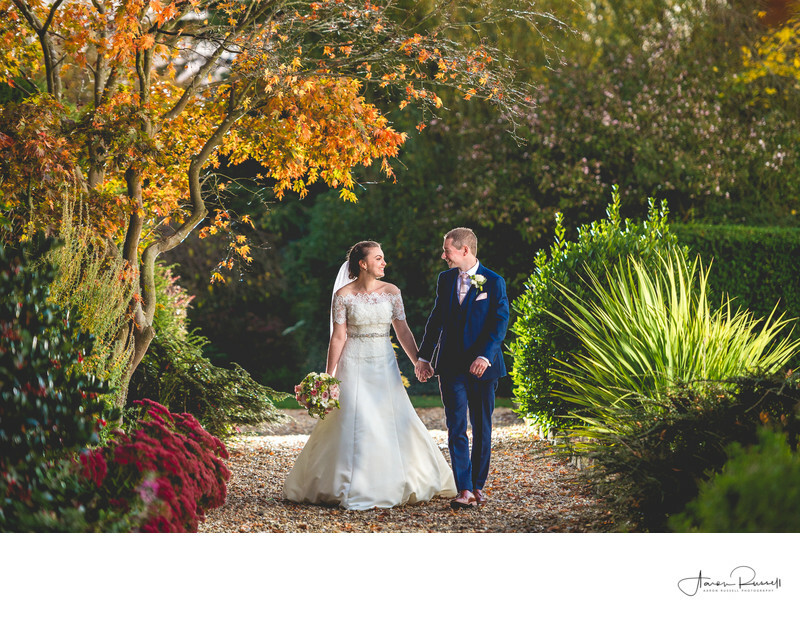 This photo was taken in the grounds just as the leaves were starting to change colour for autumn, and there were bursts of golds and reds everywhere. It was getting a little late in the day when it came to take the photos of the bride and groom, and of course in autumn the days are short and the transition from light to dark is quick. I took a few photos but the light wasn't quite right, and there just wasn't that 'pop' that I love in my photos. I knew that the solution was straight away - to produce my own light, and use it in the image how I saw fit. I placed a portable studio light to the right of the bride and groom as you are looking at them in this wedding photo, and worked the light into the exposure settings in camera so that it balanced with the available ambient light. This is the key to making sure that the image still look natural, even though flash has been used. The addition on flash to this image is really what has made it work so well. The light has picked out and enhanced the autumnal colours in the trees and bushes to the left as well as accentuating the greens in the flora to the right of the image.